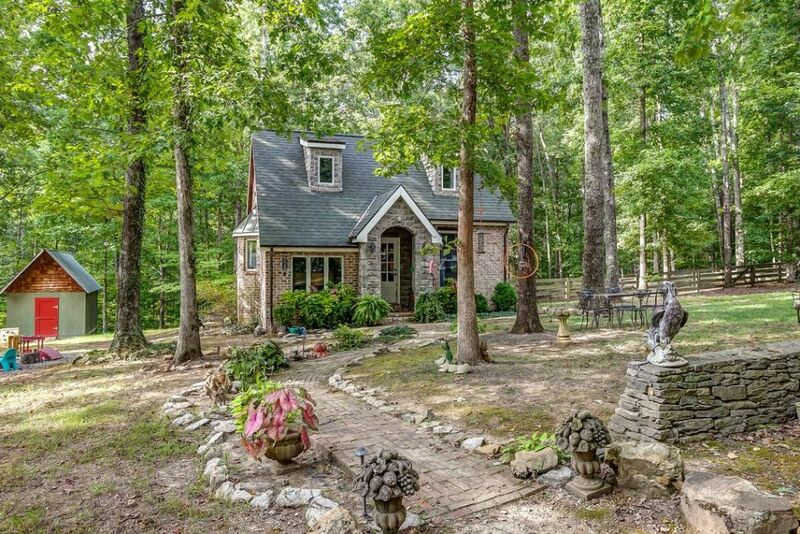 This charming little cottage looks to have come straight from the pages of a fairy tale, and is aptly named The Storybook Cottage. Located near Nashville, it sits on eight scenic acres. House & Sanctuary says it's "the perfect place to get away from your fast-paced world to find the things that matter most." 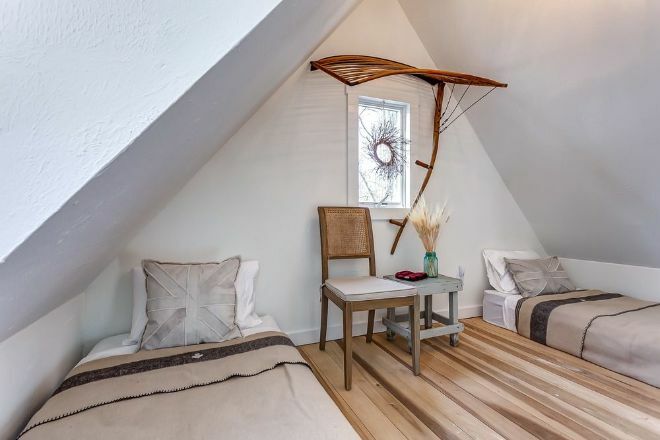 The cottage is a cozy 800 square feet that consists of two bedrooms and one bathroom. Staying in this home would truly be a memorable experience thanks to the cathedral ceilings, painted wood floors, and unique décor. Check out the lovely interior design throughout the home in the full tour below. 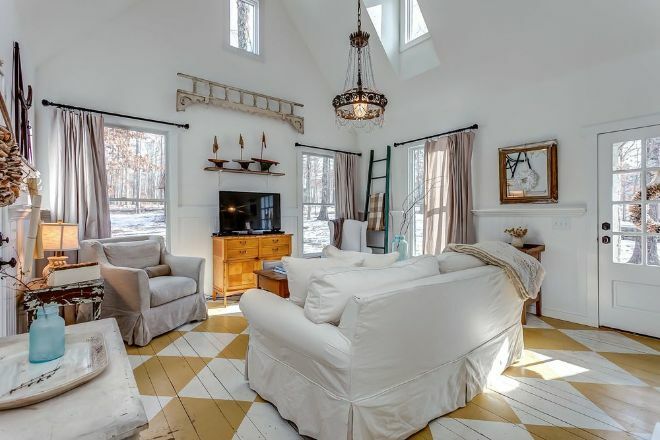 The painted wood floors in a yellow and white diamond pattern give the home a special look. The furnishings are neutral, allowing the floor to be the star of the show. A vintage chandelier highlights the cathedral ceiling. White walls keep the small space feeling bright and spacious. 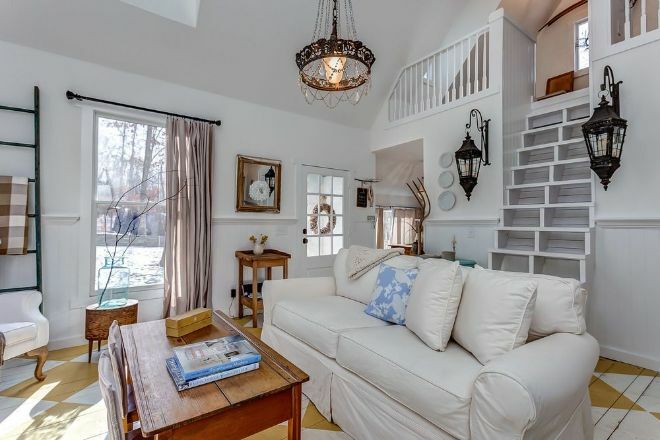 A stairway flanked in light sconces lead to the upstairs loft bedroom. Two twin beds are housed in the open loft. A one-of-a-kind window shade adds interest and a focal point to the space. 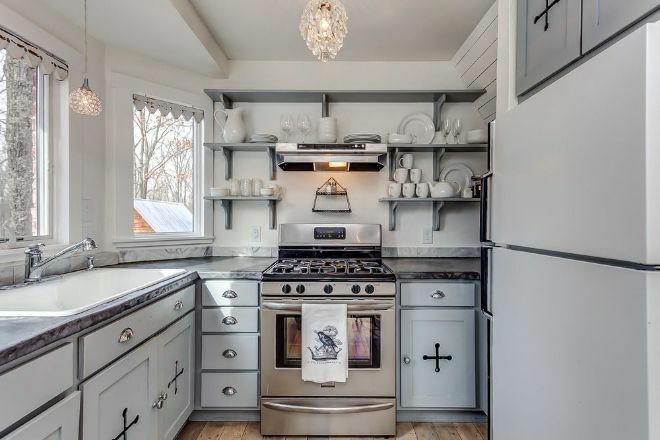 The small kitchen features gray cabinets, open shelving, and crystal light fixtures. 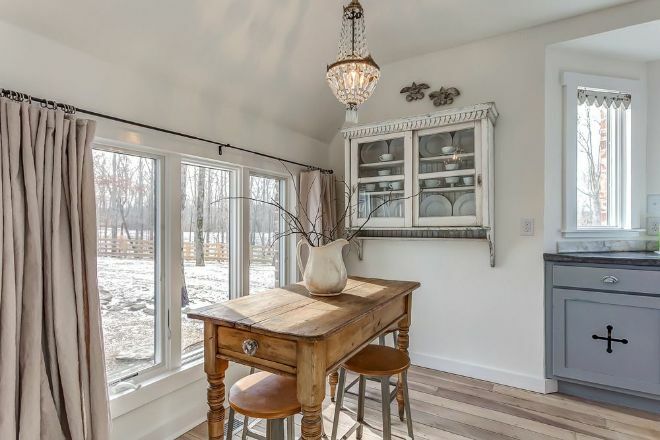 The bay windows above the sink offer natural light and beautiful nature views. A small dining space is located off of the kitchen. An antique table can be used for seating or extra prep space while cooking. A wall-mounted china cabinets is a perfect space saver where there isn't room for a buffet. The cathedral ceilings are carried into the main bedroom, and further emphasized with a blue accent wall. 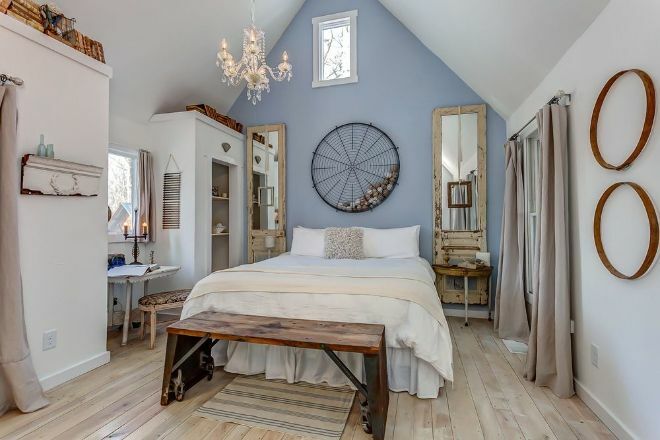 Rustic wall decor, a crystal chandelier, and bedside mirrors finish the look. 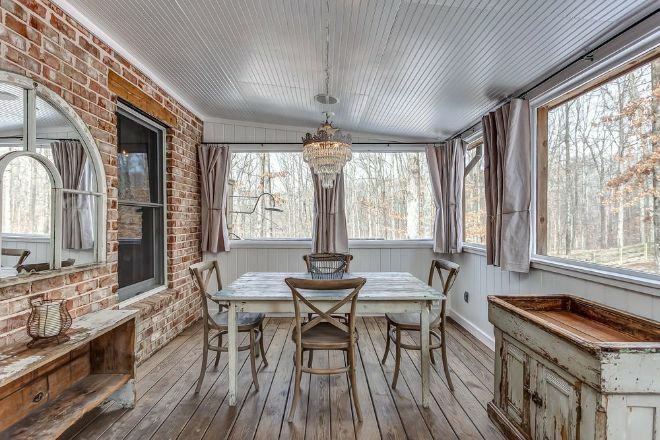 The enclosed rear porch offers more dining and sitting areas. The numerous windows allow you to enjoy the surrounding woods, and enjoy the peace of seclusion that this cottage offers.